Victor Gollancz, 1985-05-01. 122nd Annotated edition. Hardcover. Used:Good. 1985-12-01. Good. Ships with Tracking Number! INTERNATIONAL WORLDWIDE Shipping available. May not contain Access Codes or Supplements. May be ex-library. Shipping & Handling by region. Buy with confidence, excellent customer service! London: John Wisden & Co Ltd. 1985. Octavo Size [approx 15.5 x 22.8cm]. Very Good condition in Very Good Dustjacket. DJ protected in our purpose-made plastic sleeve. A nice copy. Illustrated with Black and White Photographs. Previous owner's details to front free end paper. 1280pages . 122nd Edition. Hardcover. London: John Wisden. 1985. Octavo Size [approx 15.5 x 22.8cm]. Very Good condition. Illustrated with Black and White Photographs. 1280pages . 122nd Edition. Softcover. JEAN SBOGAR "Petite Collection Guillaume"
FRANCE: E Dentu, 1894. FRENCH TEXT. 144 x 80 mm. Half black leather with five raised bands and marbled boards. Owner's name H.S. Joly stamped at very bottom of spine in gold. Marbled endpapers. Top edge gold. Inscription of owner at start of book. Book is in near very good condition with minor but just noticeable signs of wear and/or age. Spine faded to dark red, some noticeable spotting to text edges.. Hardback. nrVG. Illus. by Marold; Mittis et Picard. Wisden: 0947766006. 1280 pages, lovely throughout, no inscriptions, yellow cover. .
London: John Wisden, 1985. 1280 pages. 12 pages of b/w photographs. Cased Edition with Jacket. Condition: The page edges are starting to brown slightly. The jacket is unmarked and is protected by a removable transparent glassine wrapper. Every book is sent in a rigid cardboard posting box.. First Edition. Hard Cover. Near Fine/Fine. 16.5 Cm x 11 Cm. London: John Wisden, 1985. 122nd Edition of the cricketer's bible. Good, clean copy with some light tanning to page edges - 1,280 pages. Unclipped d/w shows light shelfwear & tear. Next post dispatch.. Annual Edition. Hard Cover. Good/Good. 12mo - over 6¾" - 7¾" tall. 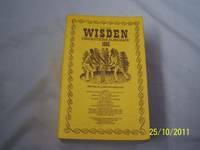 London John Wisden1985 1st edition. 1250 pages. Usual small format. A wealth of cricketing facts, figures and opinions for the year. Very good in very good dust wrapper..
John Wisden, London, 1985. 122nd Edition. Hardcover. Good Condition/Fair. Size: Small Octavo. 1280 pp. .. Ex college library. Yellow dust jacket worn and marked and faded at spine with short tear to back cover. Black and white photo illustrations and adverts. Book and contents in clean sound condition. Quantity Available: 1. Category: Sports & Pastimes; Cricket; Britain/UK; 1980s; Inventory No: 16090..
Wisden, 1985-12-01. Hardcover. Good. The wraps are sunned and a bit marked. Internally clean and tightly bound. Some damp rippling / marking. John Wisden & Co., 1985. 0947766006. 1st edn. 8vo. Original gilt lettered brown cloth (near Fine), dustwrapper (VG in protective wrapper, not price clipped). Pp. 1280 (no inscriptions), illus with b&w photos. U.K. Wisden, 1985. 12mo. hardcover. 1280pp. b/w illus. very good+. / very good d/w with faded spine . Wisden. Soft cover. Good. The wraps are a bit worn nad marked. Internally mostly clean and tightly bound. Some rippling. David & Charles, 1985-12-01. 122nd Edition. Paperback. Good. Published by John Wisden & Co Ltd, 1985, (122nd edition). Yellow card covers with brown lettering. 6.5ins x 4.25ins, 1280pp text plus 12pp illustrations. VG. London: John Wisden & Co. Very Good with no dust jacket. 122nd Edition. Soft Cover. 0947766014 . 1280pp; illustrations; 165 x 100mm . London: John Wisden & Co, 1985. Spine sunned.. 122nd Edition. Soft Cover. Very Good. 165x105mm. London: John Wisden & Co, 1985. 1280pp., plus 1 x 12 page, b/white photographically-illustrated section. Book clean. Spine firm. Leaves clean, albeit very slightly tanned on edges. Printed covers very good. Published annually before the start of the English cricket season, this reference book is considered by some to be the 'bible' of cricket. Numerous contents. Book weight approx. 700g. . Softcover. Very Good +. 16mo - over 5¾" - 6¾" tall. London: Guild Publishing. G - in good condition with rubbed dust jacket. 1985. Reprint. Brown cloth hardback cover. 160mm x 110mm (6" x 4"). 1280pp. .
London: John Wisden & Co., 1985. No jacket. Hardcover with bumped leading corners, and head and foot of spine. Lower front leading corner is worn. Small stain on front board. Spine is creased along its body. Superficial scores front and rear. Page block a little tanned and grubby. Contents are sound and clean, and the text is clear. TH.. hardcover. Good/No dust jacket. Used. London: Wisden and Co Ltd, 1985. 122nd Edition. paperback. Very Good/No dust jacket. London: John Wisden & Co Ltd. Very Good-. First Edition. Paperback. 0947766014 . Square binding, remainder mark to base, darkened edges. 750gms weight ; Remainder; B&W Photographs; 12mo 7" - 7½" tall; 1280 pages . J. Wisden. Good+. 1985. First Edition. Paperback. 0947766014 . Slight fade to spine; 16mo 6" - 7" tall . GB: John Wisden, 1985. Yellow limp cloth. Book is in good double plus condition with noticeable signs of wear and/or age.. 1st Edition. Softcover. G++. London: John Wisden & Co Ltd, 1985. Hardcover. Jacket is marked. Spine is slightly tanned. Front upper leading corner is nicked. Spine ends and leading corners are lightly worn. Edges are creased. Jacket and hardcover spine ends and rear lower edges are bumped. Page block is marked. Pages are clean and contents are clear throughout. Volume is cocked but binding remains intact. HJW. Hardcover. Good/Good. Used. David & Charles. Used - Good. Ships from the UK. Former Library book. Shows some signs of wear, and may have some markings on the inside. 100% Money Back Guarantee. Your purchase also supports literacy charities. London: Guild. 1280 pages, illustrated, statistics, index, page edges tanned, jacket spine sunned. . Very Good. Hardcover. 122nd Edition. 1985. London: John Wisden. 1280 pages, illustrated, statistics, index, small closed tear to dust jacket. . Very Good. Hardcover. 122nd Edition. 1985. David & Charles. PAPERBACK. 0947766014 Book is in good condition. Fingermarks may be present. Page discolouration present. Slight creasing present. Cover has some wear. Previous owners name may be present. -- Re-Read is a social enterprise that trades in and recycles books to reduce waste, save them from landfill and provide services and activities that promote literacy, education attainment and quality of life in South Yorkshire and supports Askern Community Library. All overseas shipping is via Airmail. . Good. 1985.